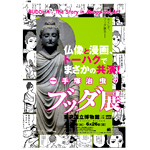 Buddha, a story in manga, was produced from a decade's work by Tezuka Osamu, the iconic manga artist renowned for such popular series as Astro Boy and Kimba the White Lion. Buddha is based on Tezuka's own interpretations of the life story of Siddhartha, the historical Buddha, and expresses the dignity of life - the eternal theme of Tezuka's works. 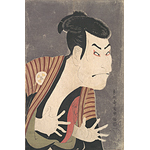 The appeal of Sharaku's prints, however, is no mere by-product of this enigma: the emphatic, abbreviated style which struck a chord among his contemporaries continues to fascinate even today. This exhibition will explore the intriguing elements of his expression and the sources of his creativity, all the while highlighting the distinctive artistic qualities of his work. 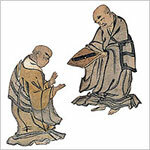 Kukai, founder of the Shingon-sect Esoteric Buddhism, saw illustrations as effective tools for transmitting Esoteric Buddhist teachings, which are complex and difficult to explain in words. For this reason, great importance was attached to visible forms in Shingon-sect Esoteric Buddhism. This exhibition introduces masterpieces of Shingon Esoteric Buddhism, with a focus on the period when philosophical elements maintained a strong presence in the works. Along with objects brought by Kukai from Tang China, works directly related to him are also featured, such as his writings and sculptures produced under his instruction. 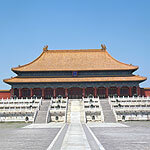 The end of the 19th century to the mid-20th century witnessed the birth of a new China. Active during this time were two men from China and Japan who shared a close bond. Sun Yat-sen was a man who devoted his life to the Chinese revolutionary cause. 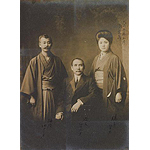 Umeya Shokichi offered Yat-sen his heartfelt support, both morally and materially, whilst building the foundations of the Japanese movie industry. This year marks the centenary of the Xinhai Revolution of 1911, an event in which Sun Yat-sen played a pivotal role. To mark the occasion, this exhibition will use primary materials from that time to tell the story of Yat-sen and Umeya Shokichi, their friendship and the people and places close to them. Honen is known as the father of Kamakura Buddhism. Amid the turbulent times of the late Heian period at the end of the 12th century, he spread the belief that salvation could be achieved by reciting prayers to Buddha. Shinran, who learned under Honen, developed practices and philosophies reflecting the society of the early Kamakura period. 2011 marks the 800th memorial year of Honen, the founder of the Jodo sect, and the 750th memorial of Shinran, who founded Jodo Shin sect. In this commemorative year, for the first time, this exhibition features the two foremost figures of Kamakura Buddhism will be introduced for the first time together in a special exhibition, which narrates their lives through related treasures. This magnificent exhibition, organized to celebrate the 40th anniversary of the normalization of relations between Japan and China, consists of a selection of 200 masterpieces from that collection, including the simultaneous display of 41 Song- and Yuan-dynasty calligraphic works and paintings not previously shown outside the palace, as well as a tremendous array of fabulous bronzes, jades and other artifacts. We hope you will take the opportunity to come and see this extraordinary encapsulation of the masterpieces of Chinese civilization.